Tuesday – DHFC representatives visit Westminster to meet MPs and Lords, lobbying their support for the club. Tuesday – Club legend Nyren Clunis rolls the ball into an empty net having torn through the Billericay Town defence in the final minute of a 3-1 victory in Essex. It’s his 98th goal for Dulwich. The team with no home and no name leapfrog their title rivals into top spot as BTFC suffer their fourth successive league defeat. 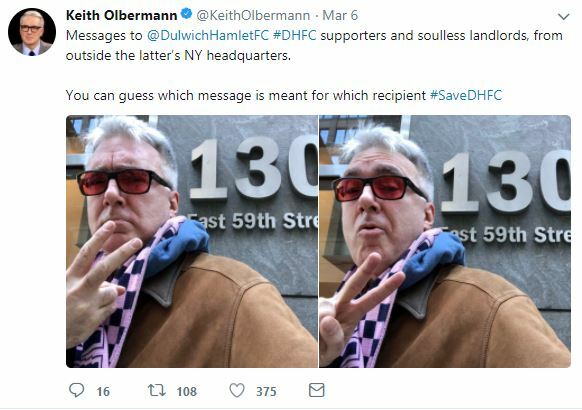 Tuesday- American sports and political commentator Keith Olbermann pledges his support for DHFC with a selfie taken outside Meadow’s New York headquarters. Copa 90 hero and New York Cosmos superfan Patrick Infurna also gets involved. Wednesday – Meadow offer peace by way of offering to return DHFC trademark, and allowing the club to return to Champion Hill. 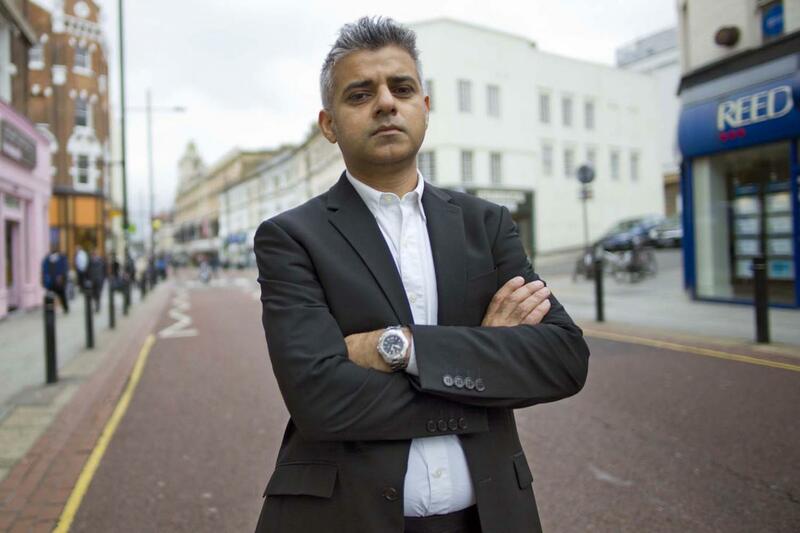 They claim that Tuesday’s actions were the result of the club criticising them on social media and in public. Thursday – Labour representative for Dulwich and West Norwood Helen Hayes secures a debate in parliament on DHFC’s current plight on Friday 16 March. 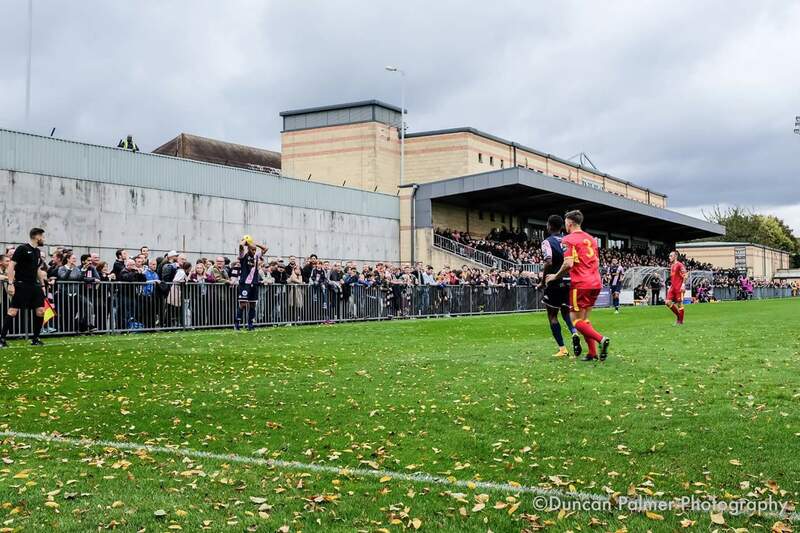 Thursday – Incredibly, a 90th minute free-kick from on-loan Hamlet goalkeeper Corey Addai finds the net and gives DHFC a 1-0 win over Brentwood Town and passage into the semi-finals of the Velocity Cup. The unlucky opposite goalkeeper? Corey’s cousin. 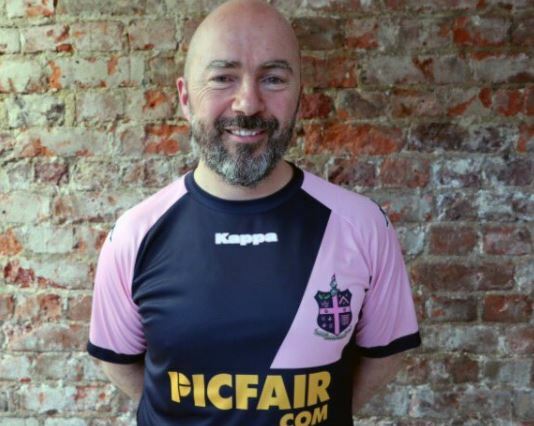 Thursday – Benji Lanyado, founder and CEO of Dulwich Hamlet headline sponsor Picfair, joins James Horncastle, Julien Laurens, David Preece and James Richardson for the latest episode of The Totally Football Show podcast. After Benji gives the lowdown on the situation at the club, former Gazzetta Italia host Richardson labels this season’s Hamlet home shirt to be among the “nicest in world football”, donning it for a quick photo in support of the Save Dulwich Hamlet campaign. This entry was posted in Reports and tagged champion hill, dulwich hamlet, james richardson, meadow, non-league, the hamlet by Ben Sibley. Bookmark the permalink.